In this exhibition the theme of perpetuation unified the work of five contemporary Coast Salish artists who live and work in this region. The word perpetuation is meant to suggest a continuum of ideas and processes, which come from distinctive traditions that have existed over millennia. 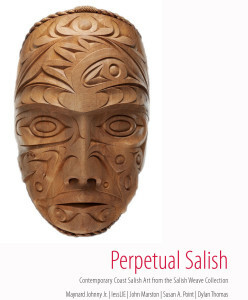 Perpetuation also infers some of the challenges that contemporary Coast Salish artists continue to face in the contexts of colonialism and assimilation as well as the dominance of other Indigenous traditions, which were often favoured by the art world, in both commercial and educational contexts. It is only in the last three decades that Coast Salish art has become more readily recognized by a wider audience as distinct from other Northwest Coast traditions. This exhibition presented a wide range of art forms and ideas, and visitors gained a better understanding of the cultural and stylistic elements that unify and inspire these contemporary artists in their own artistic practices. Artists featured were Maynard Johnny Jr., lessLIE, John Marston, Susan Point and Dylan Thomas. Watch videos about the exhibition here. See artwork and reviews of the school tours by grade four students here.